Each time you pay your employees, you will submit a Full Payment Submission (FPS) to HMRC. 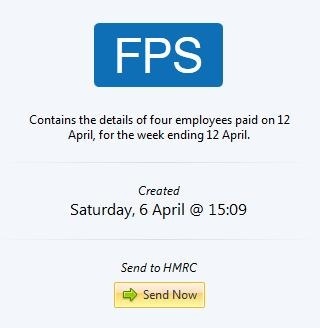 An FPS is to be sent on or before each payday, and informs HMRC about the payments and deductions for each employee. BrightPay will automatically create an FPS each time you finalise one or more payslips. To submit an FPS to HMRC, first finalise your payslips within ‘Payroll’ for the pay period in question. An FPS will be automatically created within the RTI utility, ready for submission to HMRC. 2) The contents of the FPS will be displayed on screen. The FPS can be printed or exported at any time before or after its submission to HMRC by clicking 'Print' or 'Export'. 3) When ready to submit the FPS to HMRC, click Send Now. 5) Should your submission fail, simply click on 'Details' for more information on why your submission has been rejected by HMRC and amend your payroll where required. What If The Information You Send In An FPS Is Incorrect? Having submitted an FPS, should you subsequently need to amend pay details etc. for one or more employees, simply 'Re-open Payslips' within 'Payroll' for the employee(s) in question and amend their payslip(s) as required. Finalise your payslips again. After re-finalising the payslips, if the employee's pay date matches the pay date that was included in the original FPS, an amended FPS will not be created. Instead, the amendments made to the employee's payslip will be included in the next FPS created when the payroll is next updated, where the employee's year to date figures will be reconciled. Alternatively, an Additional FPS can be submitted to HMRC to inform them of the updated year to date figures for the employee. An Additional FPS can be prepared and submitted to HMRC within the RTI menu. If a different pay date is used on the employee's payslip, a new FPS will be created - please note submitting a new FPS using a different pay date may cause reconciliation issues with HMRC. If no employees are paid in a particular pay period, a nil FPS will be created when the zero payslips are finalised. The nil FPS can then be submitted to HMRC in the normal manner. Where salaries are taken sporadically, for example a one-person company with a sole director, a number of nil Full Payment Submissions may arise. For example, a director receives a salary in April and is only paid again in September. This will result in four nil Full Payment Submissions being created when the payroll is finalised for May, June, July & August. If these payroll periods are only finalised in September when the next salary payment is made, these can simply be marked as 'sent' in BrightPay, thus avoiding a late submission trigger. 1) Click the RTI tab heading and select the FPS from the listing. IMPORTANT: If there are no payments in the current or earlier/historical tax periods for which there will be no FPS(s) submitted, then this must be communicated to HMRC via the Employer Payment Summary (EPS). This is indicated using the 'No Payment For Period' indicator on the EPS. Alternatively, zero pay tax periods can be communicated in advance to HMRC by using the 'Period of Inactivity' indicator on the Employer Payment Summary (EPS).